I can remember translating a text about plastics with my students once. That year, they came from Canada, the US, the UK and Ireland. Cling film was mentioned and it sparked off a most vehement hate session about French products and film étirable in particular. First, instead of having a metal serrated edge to tear off the film, the box has inefficient tiny plastic teeth. No comment. Second, the film itself is sticky and flimsy and has to be handled with great care and two hands (once you’ve managed to unstick it after finally managing to tear it off and half break the box). I understood them totally. 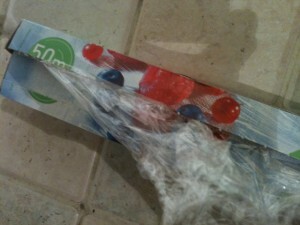 Relationnel and I went to London one year in the car and I bought back 10 boxes of real cling film from Marks & Sparks. I’ve only just run out of it and now I have to devise all sorts of ways of NOT using the stuff you get here. I purposely didn’t bring my kids up on Vegemite because it seemed a bit pointless to have to keep relying on gifts from visiting Aussies who already found it difficult to limit their baggage to 20 kilos. You can of course get it at Fauchon’s – you can get anything at Fauchon’s on Place de la Madeleine – but I lived in the suburbs in those days and the sheer thought of trekking into Paris with two kids in tow was often too much for me. The first time Leonardo smelled Vegemite, he ran a mile anyway and I had to be very careful I didn’t eat it near him after that. He has a very keen sense of smell. I still get a kick out of the occasional little jar of Vegemite to put on butter and toast. Haven’t had one for a long time though. Bacon is something you can’t get here. There’s a thing they call bacon but it’s roundish and thin and doesn’t have the tail bit that you need for a crisp piece of fried bacon to eat with your eggs. My mouth’s watering just thinking of it! They don’t have T-bone either. Well, most places don’t and when they do it’s not real T-bone. When I was a kid and we spent three or four days in a row travelling down the coast from Townsville to Brisbane on holidays (it was only years afterwards that I really understood why Mum and Dad weren’t talking to each other by Rockhampton – there were six of us in the car), we’d have lunch in roadside cafés and there’d be T-bone on the menu. Dad would never let me have it because he reckoned I’d never finish it. I finally persuaded him and ATE THE LOT. After that, he couldn’t say no. I’ve loved it ever since. They have côte de boeuf here instead which really isn’t bad. It’s just missing the smaller side of the T and is thicker. Also, it’s really for two people. Even I can’t eat a whole one. The last time we were going back to Australia, I asked Townsvillean if he wanted anything from France. And do you know what he said? Pansements. Band-aids, you want band-aids? He particularly wanted URGO. 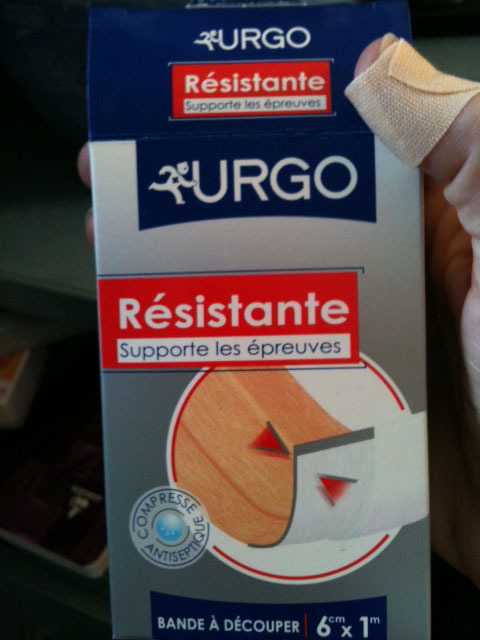 Apparently Australian band-aids are inferior and don’t stick properly whereas the ones here do. See, just like the cling film! I guess that’s a French quality. They know how to make things stick. So, tell me, what are your bugbears and favourites from other places? This entry was posted in French customs and tagged bandaids, cling film, Fauchon, T-bone. Bookmark the permalink. No bugbears or favourites. Only, when you mentioned Vegemite, I was reminded of Marmite which came in small dark brown jars with yellow lids. I hated it. Though it was vegetarian, I associated it with Bovril which, like any “well brought up” Hindu, I couldn’t stomach. Aussies consider marmite to be very inferior to Marmite of course! They’re both actually made from yeast extract and are a by-product of beer brewing so are perfectly vegetarian. Vegemite is quite salty. You’re 100% right about French cling film! We don’t use it particularly often (preferring to use the Tupperware), but I find the only thing it doesn’t stick to is the dish I’m trying to cover. That said, I find the baking paper rolls even more infuriating – no plastic teeth there. Instead, they put cardboard teeth which are too flimsy to use (in fact, I’ve completely ripped the box). I guess the saving grace is that baking paper can be easily cut with scissors. The côte de boeuf can be incredible – a couple of weeks back I was having dinner with a few friends in a little restaurant at the Place du Marché Sainte-Catherine, and the serving was so enormous even two couldn’t finish it. Not only that, the quality was excellent and they had cooked it perfectly. Certainly satisfied the cravings for some Aussie beef! Brainy Pianist, you really made me laugh! The alfoil also has cardboard teeth and I hate it. I waste so much. And the côte de boeuf certainly can be incredible. A good place to have it is the Taverne de l’Arbre Sec at 109 rue Saint Honoré. But it’s even better over an open fire! I definitely remember French cling wrap… although I thought it might have been because we were students and buying the cheapest (and inferior) product! I will have to think about other products but I can tell you that I have been searching for quality baguettes in Sydney and so far I am not faring very well! You know why you can’t get quality baguettes? It’s the humidity in the air. It doesn’t seem to suit the French dough. However, you might try looking for a Vietnamese baker. They seem to have overcome the people better! Isn’t it funny some of the things one remembers! I, for one, don’t remember that discussion at all!! But I could certainly picture it in my mind’s eye! I think I have a hate for cling wrap in general though. You’re forgiven! I actually had the same mix of nationalities another year, so it wasn’t your class. Recently I found a special cling-wrap dispenser and, do you know, it doesn’t work any better because it’s the same cling wrap!